I lived and worked in the Queensland mining town of Mount Isa for a couple of years in the early seventies. I was single, and apart from football and cricket, there was not a lot of social activity other than the pub. The hotels were heavily populated with other single males, there being a dearth of single women in the place. As a result, I arranged to get myself a second job as a driveway attendant at a service station for the dual purposes of saving money and keeping out of the hotels (which also saved me more money). There was no self-service concept at a servo then, and my job was to refuel the vehicle, clean the front and rear windscreens, check the oil and water, and also check the tyres. We stayed open until 10pm, and the night shifts were OK, but the weekends were a hard slog in the heat of Far North-Western Queensland. I remember working at the servo one Christmas Day when the ambient temperature was over 45 degrees - stepping onto the cement driveway was like walking into a pizza oven. The most popular town picture theatre was the drive-in. Most vehicles contained two or more males, and were often utes or flat-tray trucks - that way you could reverse into the spot and set up deck chairs and eskies to watch the film in suitable comfort in the warm open air. One year, Queensland trialled daylight saving for the first time, and the drive-in couldn't commence screening much before 10 pm because dusk was so late. If you check a map of Australia, you'll find that Mount Isa is actually further west than Melbourne (almost as far west as Adelaide, which is a half-hour behind AEST), a fact that has won me a bet or two over the years! That rather drawn-out story brings me to today's post, which is about the suburban picture theatre, the Plaza Theatre at Paddington. 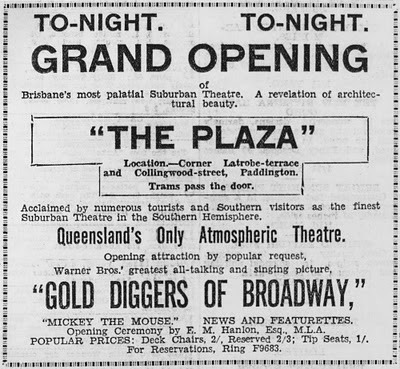 Pictured above is a newspaper advertisement for the opening of the Plaza in 1929 or thereabouts. "Queensland's Only Atmospheric Theatre", it trumpets. I thought that meant that the movies were accompanied by rolling jaffas and the stifled farts of teenagers, but what it really means is that the interior of the theatre was decorated in an exotic manner to create an outdoor atmosphere. A couple of other things about the poster: the main feature Gold Diggers of Broadway was apparently Warner Bros' second ever "talkie" and became a smash hit, making the song Tiptoe through the Tulips a favourite as well; the supporting feature was Mickey the Mouse; and admission varied between 10 cents and 23 cents, depending on your required level of comfort. Note too, the old-style telephone number: F9683. The Plaza now is the home of an antique store, and continues to attract the citizens of Paddington and wider areas through its doors. Its picture theatre dimensions can be seen in my recent photograph above. Don't you wish people kept ephemera? That flyer from the 1920s picture theatre is now a little treasure trove for historians and a joy for historically minded bloggers and collectors. Every line needs to be decoded by today's readers. Young Brisbanites would not even know what "trams pass the door" means. Nor would they know what "featurettes" were. Melbournians would not understand how you could get "deck chairs" into a picture theatre. I love it! Thanks Hels. It is certainly a real buzz when one of these relics is uncovered. Numerous tourists and Southern visitors... Folk spoke funny back then didn't they? Great stuff. I'll be driving by it tomorrow and looking at it with wiser eyes. Yes, poor old Brisbane. It seems that we needed the approval of southerners to reassure ourselves that it was any good! Thankfully those days have changed. Do you think you might have a look at the photo I posted today? I assumed because it had Waltons painted on it, it was the old department store... but I'm not sure anymore. Thankyou! Where is the sign? Memory tells me that Waltons was on the corner of Wickham and Brunswick - now that area is a shopping mall & entrance to the Valley railway station. If the sign is somewhere else, I guess it could have been an advertisement.